You might know from some of my previous posts that I’m a massive fan of Great British Bake Off – and that I was a particular fan of finalist Luis Troyano in last year’s series. I absolutely loved his attention to both visual detail and flavour (check out my attempt at one of his recipes), and was ever so slightly disappointed that he didn’t win. However, he’s still baking and has a book, Bake It Great, coming out in August. I was rather delighted when he announced that he would be holding a special afternoon at the Stockport Plaza (a beautiful old cinema conveniently close to my area) to promote the book. Of course, I just had to get a ticket! The cinema really was a lovely setting. The afternoon tea was held in an Art Deco cafe/restaurant decorated in a tasteful yet simple style – very much like what you’d expect a classy tearoom would have looked like in the 1930s. There were quite a few people already tucking into their cakes when we got there, but it was all very relaxed and friendly. We were shown to a table, and tea and three tiers of food loveliness appeared soon after we sat down. You can’t see them in the photo above, but the bottom tier had lots of finger sandwiches – egg, cucumber and salmon. However, it was the sweet treats we were most interested in, and which Luis himself had made in their entirety. 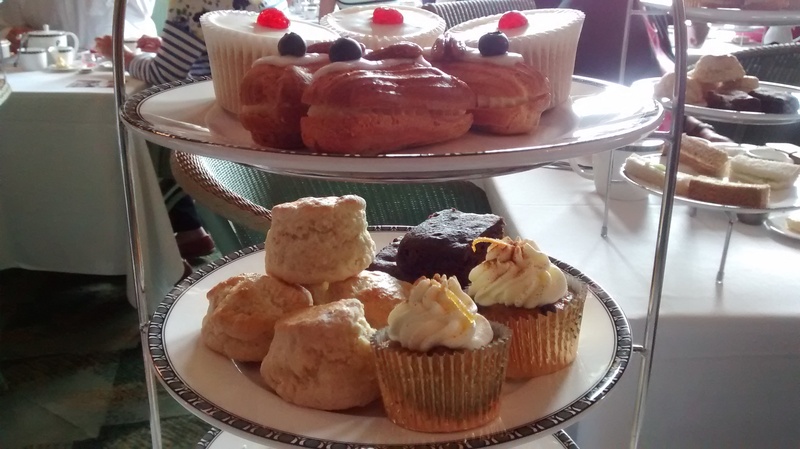 As well as the compulsory scones with clotted cream and strawberry jam, there were chocolate brownies, Bakewell cupcakes, carrot cake cupcakes, and blueberry cheesecake eclairs. YUM. After polishing off the sandwiches, we started with the scones, which were perfect – substantial yet extremely light. 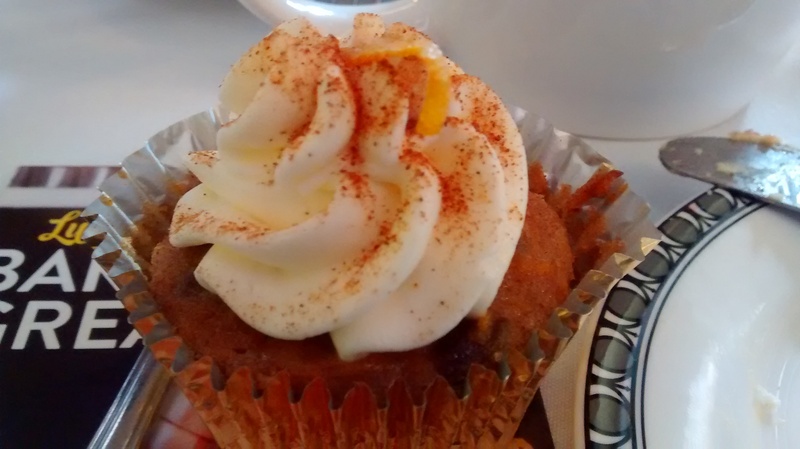 Then I moved on to the carrot cake cupcake, which was bursting with zesty orange and fruity sultanas and topped with a fantastic mascarpone buttercream. I’m so glad it was proper buttercream and not the overly sugary icing you usually get on cupcakes! 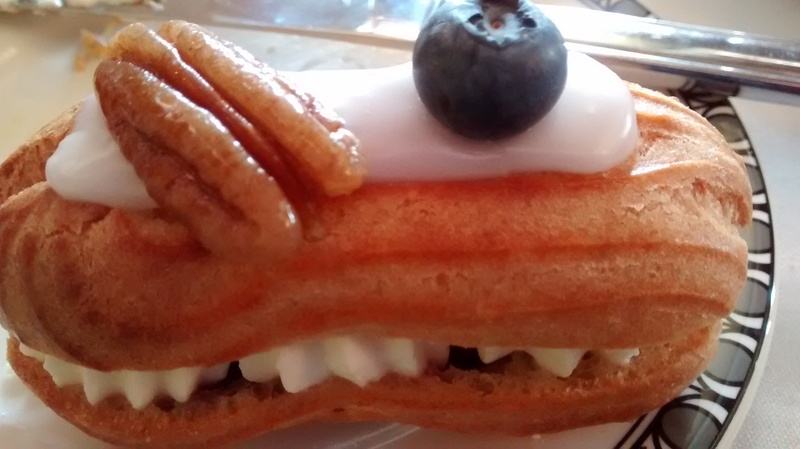 Then it was on to the blueberry cheesecake eclairs – choux pastry sandwiched with a cheesecake-y filling and fresh blueberries. This was so inspired – I’ve never thought of using cheesecake as a filling for eclairs, but it’s such a fantastic idea! The choux was very nicely made and not too heavy. Perfect. 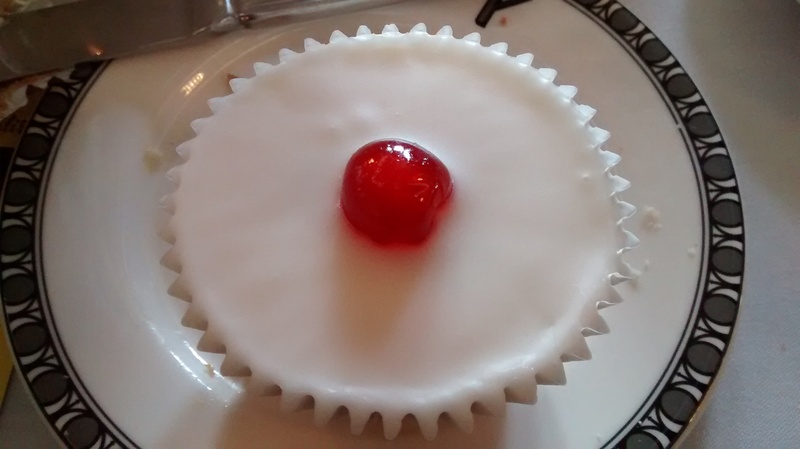 Next, the star of the show – Bakewell cupcakes. My, these were so good! 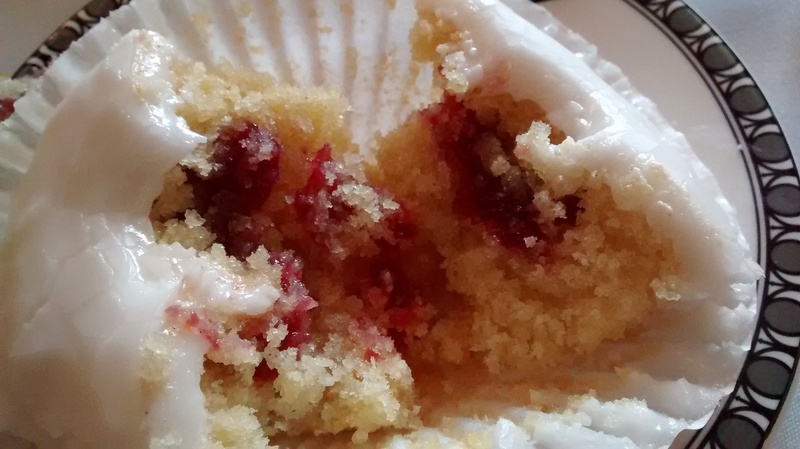 They looked pretty unassuming, but they were actually filled with delicious jam. The sponge itself was delightfully almond-y. So very good. The recipe for these cupcakes will feature in Luis’s book – I know what I’m going to make as soon as I get my hands on it! Finally, it was time for the chocolate brownie (apologies for the blurry photo, but I was concentrating more on eating than on taking pictures!). I was a bit worried I might not have room for everything, but going for a long run that morning seemed to increase my appetite quite a lot! 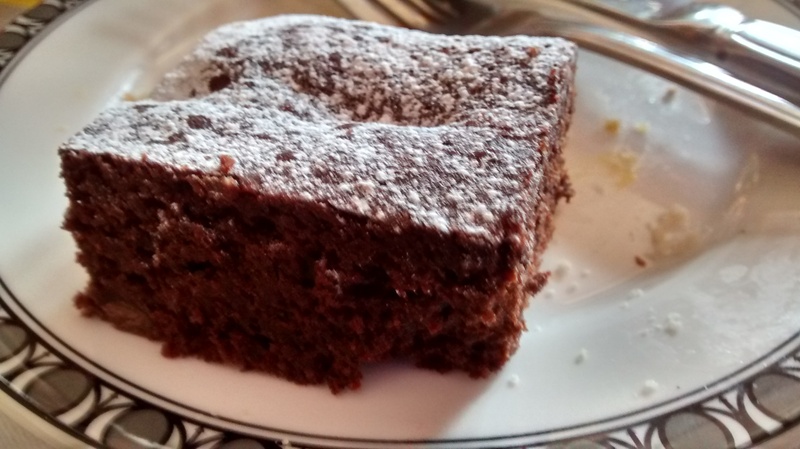 I savoured every bite of this brownie – it was very chocolatey indeed, but balanced nicely against vanilla and salt, so it wasn’t too sweet and was scarily addictive. As we ate, Luis made his way through the room and stopped to speak to everyone and answer questions, which I thought was nice of him. I asked him what was in the brownies, and my boyfriend fiancé praised the eclairs. Luis then revealed his secret to making the perfect choux, which I can’t actually remember in its entirety now (it’ll be in his book, hopefully), but involved keeping it in the oven for as long as possible without opening the door before you’re supposed to, as that affects the bake. It was lovely talking to Luis, and nice to know that he’s every bit as approachable and kind as he seemed in the show. All in all, we had a fantastic time and enjoyed all of the food immensely. I’m now hoping that Luis’s fellow GBBO contestant Chetna Makan has the same idea and decides to hold an event near me too…! I had a hankering for cookies yesterday, so I opened a few of my recipe books for inspiration. 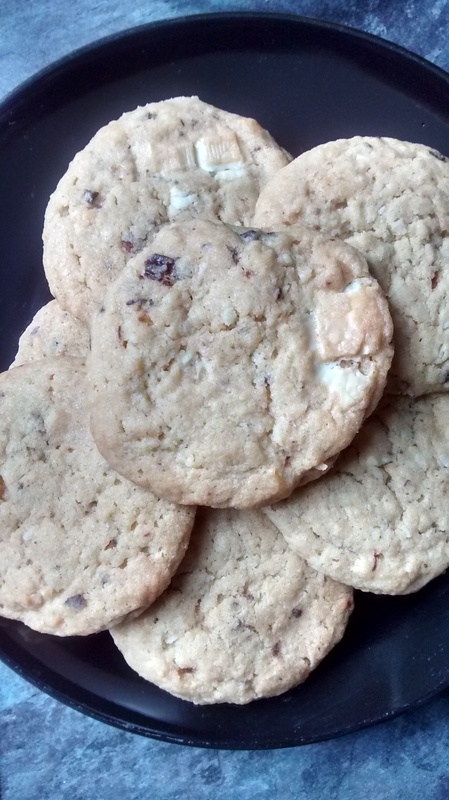 I came across a few cookies recipes that I quite liked the sound of, but weren’t quite what I was looking for, so I decided to combine them to create these chocolate, coconut and cardamom cookies. 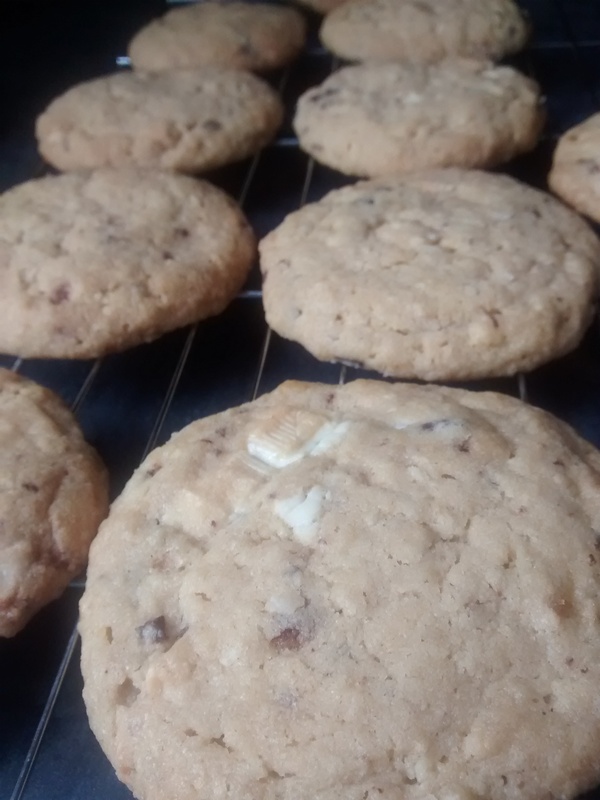 I used my usual basic cookie recipe and pretty much just made up the rest as I went along, adding freshly ground cardamom seeds, dessicated coconut, white chocolate and a little dark chocolate that needed using up. Then it was time to bake them and keep my fingers crossed. The result was delicious, if not quite what I expected! 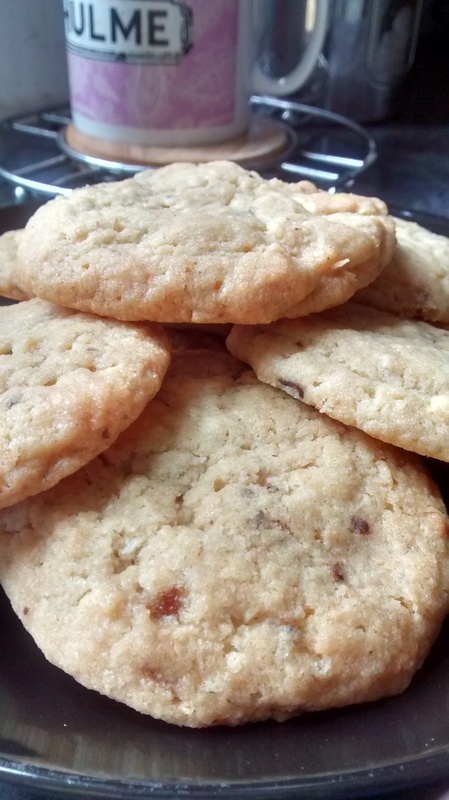 My experience of baking with cardamom is that a little goes a very long way, as it can be quite a pungent flavour, so I was surprised that the cardamom wasn’t quite as strong as I thought it would be. However, that’s no bad thing, as it was still in the background and didn’t overpower the chocolate and coconut. As always, I thought the cookies could have been a bit more coconutty, but they’re lovely as they are. I think this recipe would work well with any type of chocolate, really – you just need to be careful to adjust the amount of sugar you put in accordingly, depending on whether you go for all white chocolate, milk chocolate or dark chocolate, or a combination of these. My recipe below lists the quantities that I used, with suggestions for adjusting these depending on which flavour you most like. 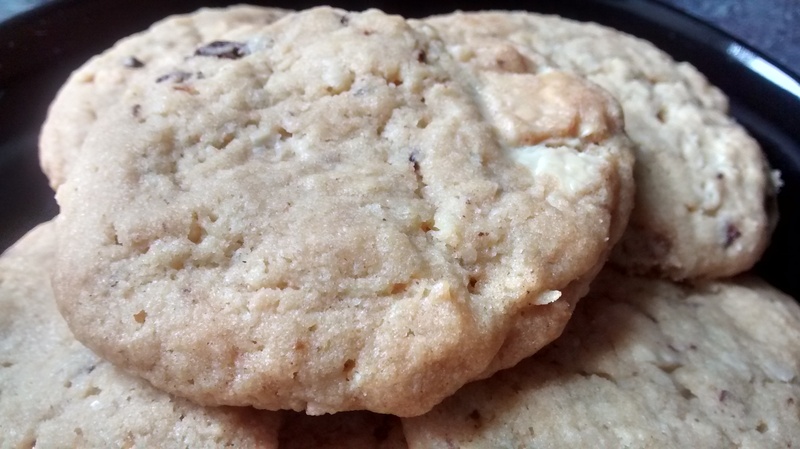 If you’re looking for a cookie recipe with a difference, this could be it! Pre-heat the oven to 180C/Gas 4/fan 160C. Line some baking trays with baking paper. Release the seeds from the cardamom pods and grind them to a powder in a spice grinder or mortar and pestle. Add the butter, sugars and cardamom to a large bowl and beat until light and fluffy. Stir in the flour, coconut and milk, and mix well to create a loose cookie dough. Stir in the chocolate, ensuring it’s evenly distributed throughout the mixture. Take spoonfuls of the dough and roll them into balls, flattening them slightly as you place them on the trays. Space them out to allow for spreading (I usually place no more than nine dough balls on my medium-sized trays). Bake for 15-20 minutes, until you can see the edges browning but the middles still look a little soft. Take the cookies out of the oven and leave to cool on the trays for 5 minutes, before transferring them a wire rack to cool completely. 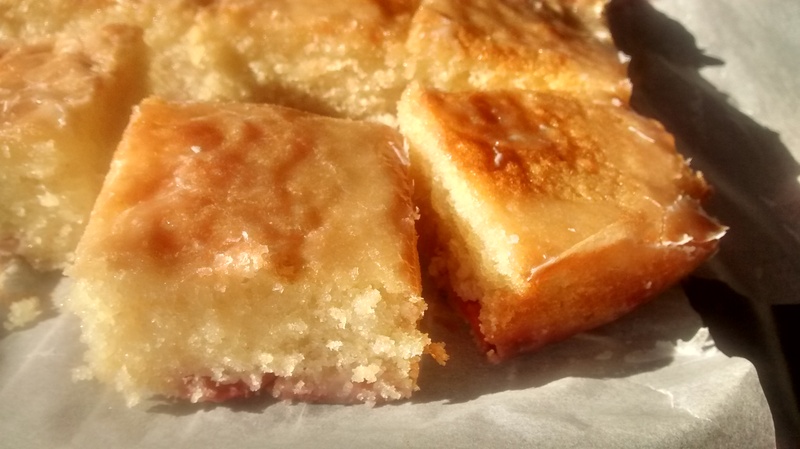 This is my first post about something I’ve baked in well over a month… crazy! 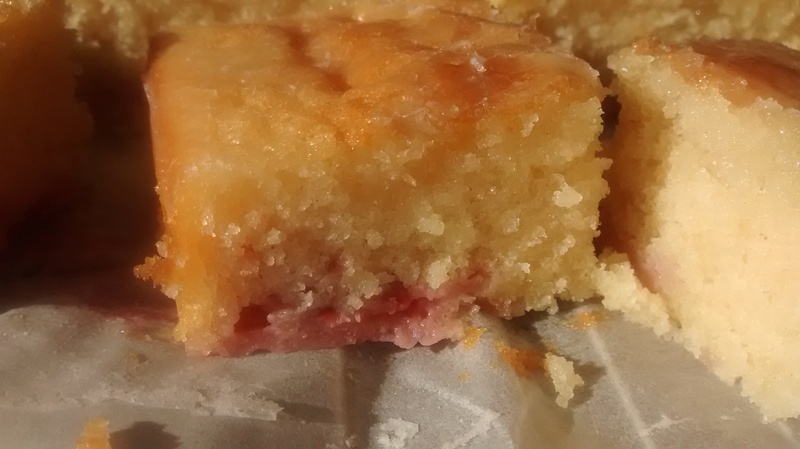 I got back on to the baking wagon in fine style the other week with this strawberry yoghurt cake with lemon drizzle icing, which I decided to make thanks to some leftover strawberries that were practically begging me to bake with them. 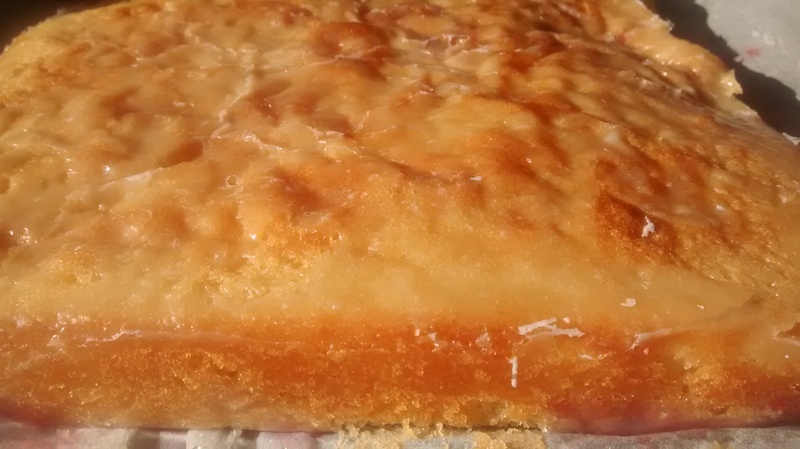 I decided to use this recipe because I’m a sucker for a cake recipe that has that something extra to create a lovely, rich texture – it was yoghurt in this case, but buttermilk and soured cream are just as fantastic. I made sure to use full-fat yoghurt here, as low-fat yoghurt lacks the richness that makes a cake truly special. 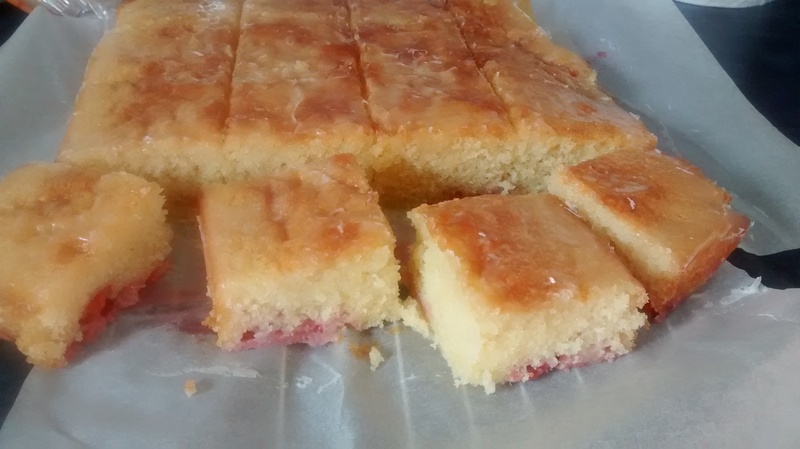 The cake was brilliantly easy to make, although I did have to leave it in the oven for a bit longer than the recipe said. I also added a little lemon zest to the cake mix to add some extra tang. And you can never have too much lemon! The texture of this cake was BEAUTIFUL – soft, moist and oh so addictive. I’m slightly ashamed to say that two of us demolished the cake in just two days (although I only had a quarter of it!). We just couldn’t stop eating it. I’d highly recommend making this cake if you want a teatime treat that makes the most of our wonderful British strawberries while they’re in season. You won’t regret it! 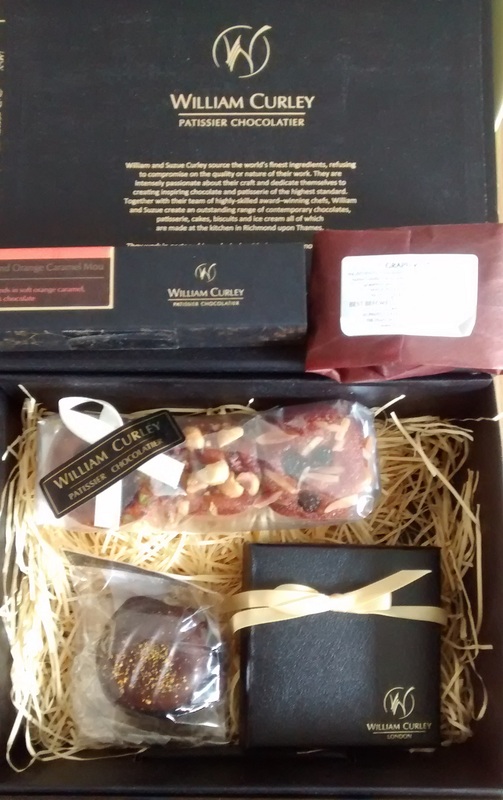 I promise to put up a proper baking post next time, but for now, I wanted to complete my trio of William Curley Chocolate Club reviews (see the February box review here and March here). I received the last box of my subscription in April, but didn’t actually polish it off until a couple of weeks ago – shocking, I know! My slowness in finishing it off had nothing to do with the contents being horrible or anything like that – in fact, I was so sad it was the last box that I was determined to make it last for as long as possible. 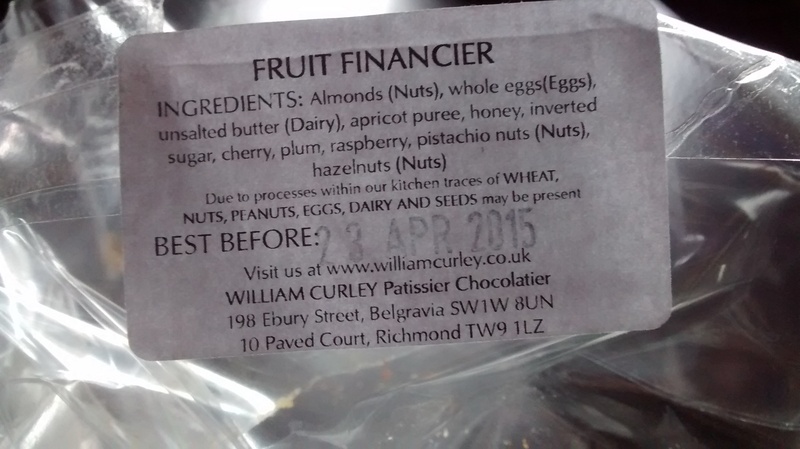 I started with the mini fruit financiers, as they had to be eaten by the looming best before date. I was a little surprised (but not disappointed) to receive these, as they had no chocolate in them at all, but they were exceedingly delicious! 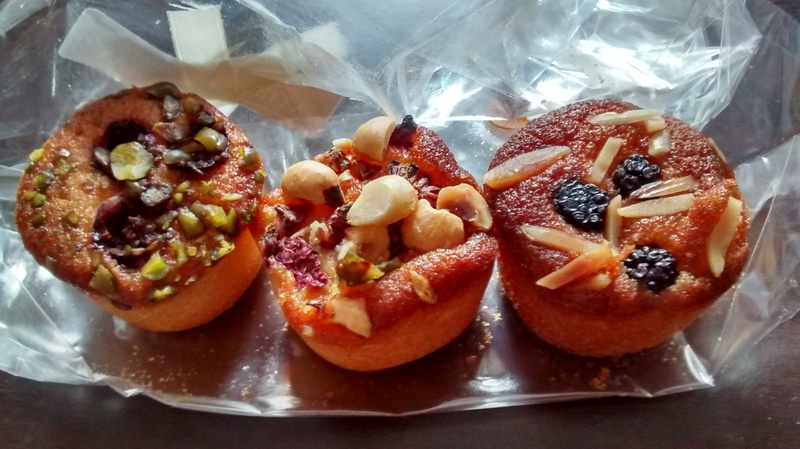 I can’t remember the exact flavours now, but you can see from the ingredients label that each cake was a mixture of fruit and nuts. I do remember that the pistachio financier was particularly divine. Next up was the selection box. I received one of these in my first box and absolutely loved it, so I had high hopes for this one. 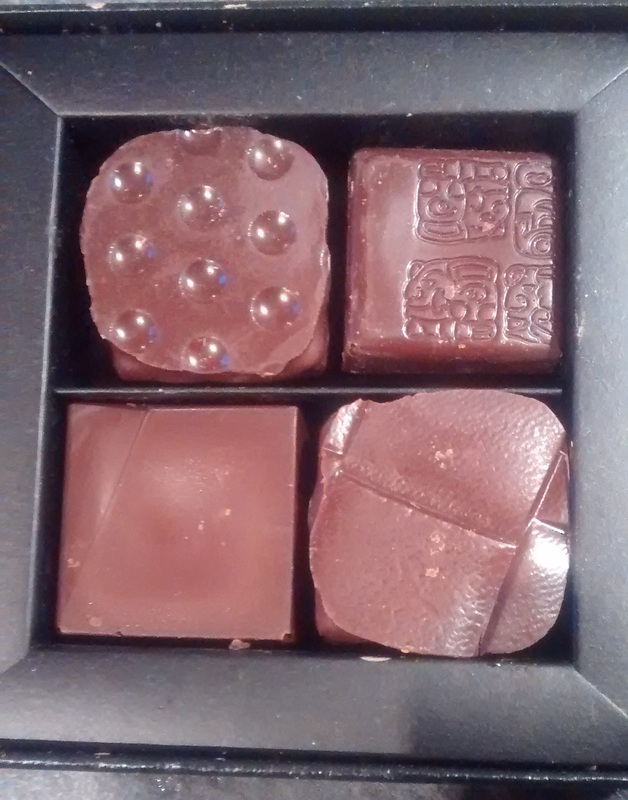 Unfortunately, I didn’t have any way to tell what was in these chocolates (apart from my own woefully lacking sense of taste), as it didn’t come with a ‘menu’ and I didn’t have the one that came with my first box. Cue some scribbling of notes as I tasted each chocolate… I think one of them was some sort of salted caramel and another was strawberry, but the other two flummoxed me a bit (my notes: “fruit jelly – cherry?” and “fruity caramel?”. Whatever they were, they were all delicious! Then it was on to the orange teacake – teacake as in Tunnock’s, not the fruity bready type. 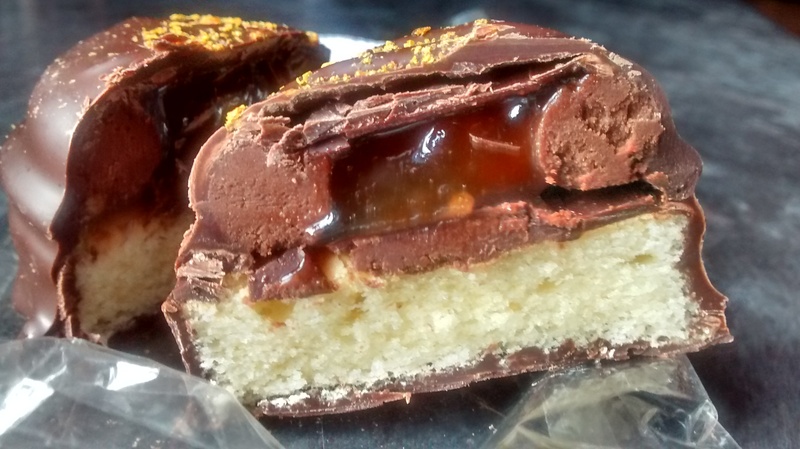 This was a bit of a taste sensation – a substantial shortbread-type biscuit with a generous blob of orange jelly on top, all covered in a thick layer of chocolate. Lovely! I was a bit puzzled by the Grapefruit offering at first. Were these preserved grapefruit segments covered in chocolate? 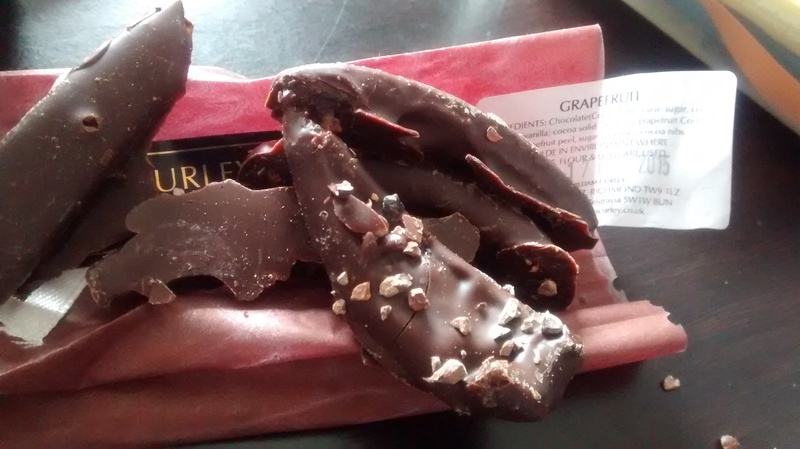 Or wedges of grapefruit-flavoured chocolate? Neither, as it turned out. They were slivers of grapefruit jelly covered in lots and lots of chocolate – quite similar in concept to the Orangette from my first box. Again, this was delicious and definitely a little bit different. 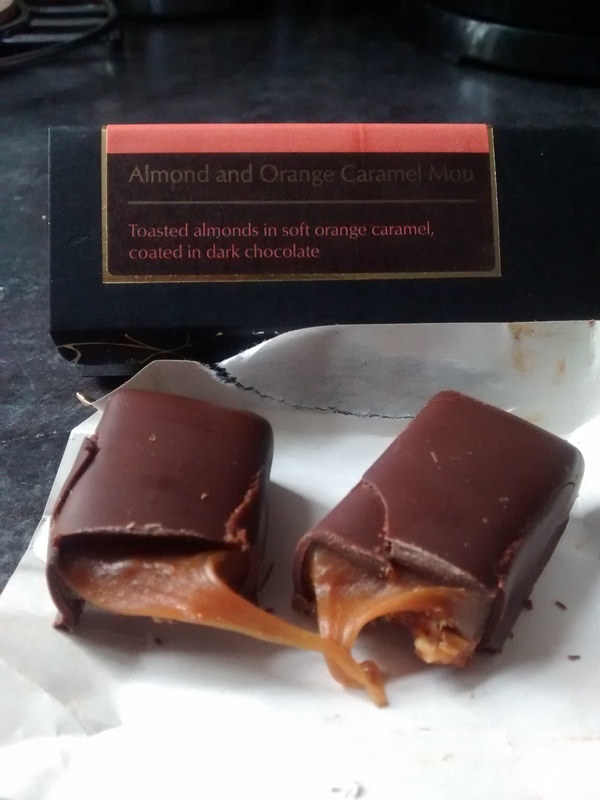 My last treat to try was the almond and orange caramel mou, which was basically a pair of chocolate bars filled with almonds and orange-flavoured caramel. I knew I would love this, and it didn’t disappoint. I would be seriously tempted to buy this again if I ever get the chance to! So, there ends my Curley Chocolate Club experience. It was a fantastic experience all in all, and I have to commend my former colleagues for choosing such a brilliant gift for me! Everything I received over the last three months was of an exceptional quality, and there was nothing I didn’t like. I’ve said it before, but I would most certainly recommend a subscription if you’re looking for a special present for the chocoholic in your life – or if you’re the said chocoholic and fancy treating yourself. Do it!